This stately Martha's Vineyard home has new bamboo floors, a gorgeous yard, and an outdoor shower to wash away the sand and surf. And you're in a beautiful secluded area, too. 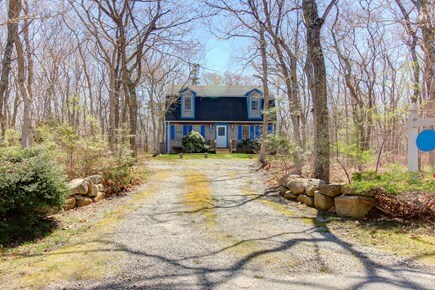 The heart of Edgartown is only five miles away, and Ben Toms Preserve and other natural wonders are mere minutes away. Just down the road you'll find Manuel F. Correllus State Forest. Dubbed The Blue Cape, this lovely home boasts lots of natural light and a lot of space. 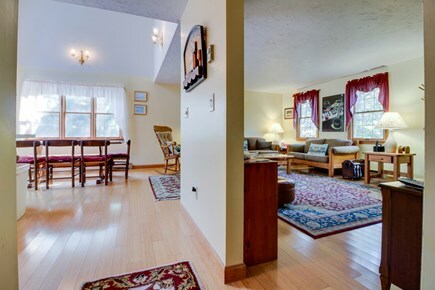 The living room has two comfortable couches as well as a rocking chair, ottoman, bamboo floors, and Persian rugs. You can watch a movie or your favorite cable show on the flatscreen TV. 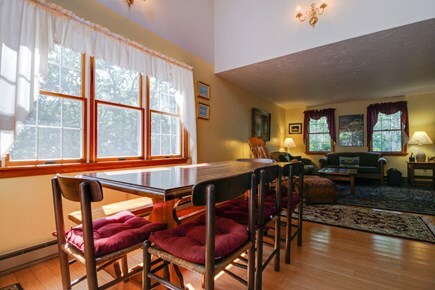 The dining room has vaulted ceilings and skylights as well as an eight-seat dining room table. 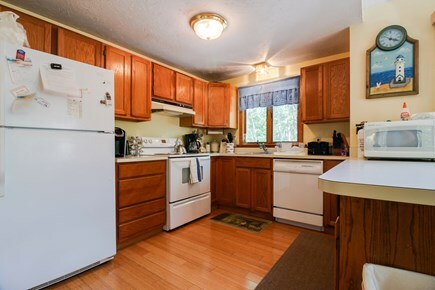 The kitchen offers a three-seat breakfast bar and a dishwasher, among other appliances. Grill your catch on the gas grill on the back deck, accessible via the sliding glass doors. 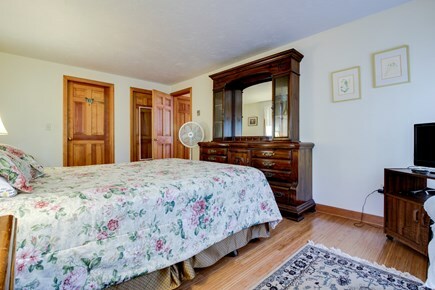 The master bedroom lies down the hall and features a queen bed, a large dresser, and a flatscreen TV. 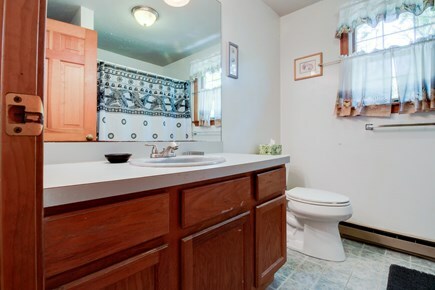 You'll find a bath with a standalone shower around the corner. 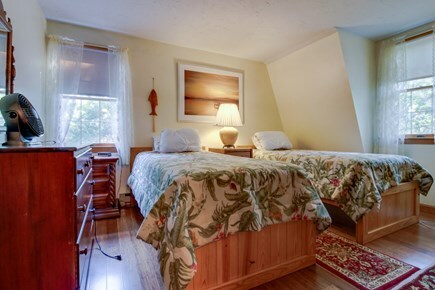 Two additional bedrooms, with two twins apiece, await upstairs as well as a loft with a queen futon. 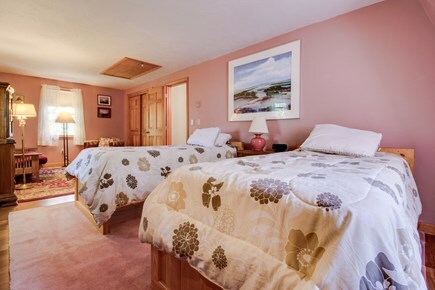 One of the bedrooms has a queen futon as well. 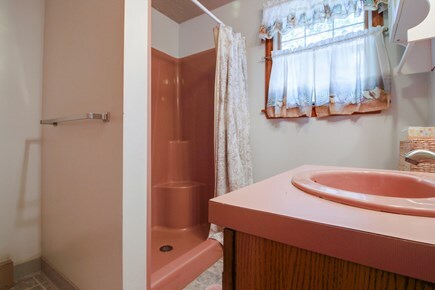 You'll find another full bath on this level. 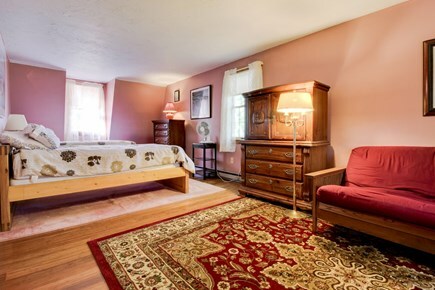 This home can comfortably sleep eight guests. Free WiFi, cable, and a washer and dryer are on hand, as is an outdoor shower. You'll find lots to do in Edgartown, from hiking to biking to beach combing and dining al fresco. 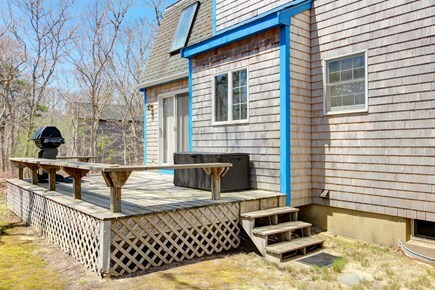 This charming and secluded Martha's Vineyard home will make for a relaxing vacation on the island. A nice location for a large family. Nice house, plenty of space for everyone in our party, quiet neighborhood. 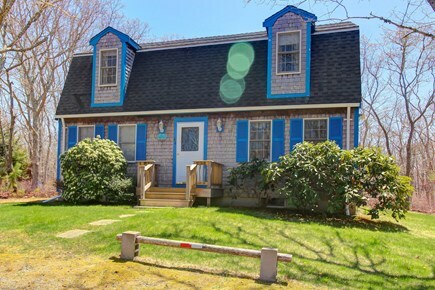 The house is located near Edgartown in a very quiet neighborhood. It was easy to get everywhere from the location. We hated to leave. This house had plenty of room for the four of us. We enjoyed having the front room to gather and process the day. We didn't use the kitchen, preferring to go out. Beds were comfortable. 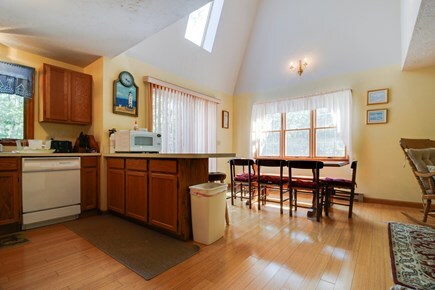 Overall the house is clean and neat, there were enough beds and sofa beds for sleep of 8 people. We have everything we need. Will definite stay again! This was a great place to stay this summer. 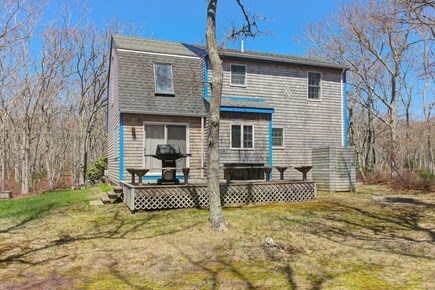 About 2 miles from downtown Edgartown and beaches. Convenient to roads reaching rest of island as well. House is in excellent shape. Had all linens, kitchen items, etc. Much better than other houses we have rented. Vacasa was great as well. I would stay here again!